More than 100 people have been killed and scores are missing in landslides and flooding caused by heavy rain in Mexico. The death toll stood at 101, with 68 people missing following a massive mudslide that swallowed half of the village of La Pintada, in Guerrero state, according to Miguel Angel Osorio Chong, the interior minister. Mexico was hammered by tropical storms Ingrid and Manuel, which left a trail of destruction that damaged tens of thousands of homes, flooded cities and washed out roads. After regenerating into a hurricane and hitting the northwestern state of Sinaloa late Thursday, affecting 100,000 people and killing three, Manuel finally dissipated over the mountains. 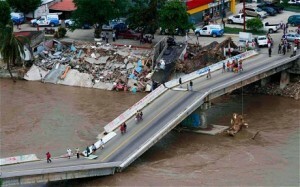 People walking on a collapsed bridge in Acapulco. The highway department warned travellers that the trip north, which usually takes around four hours, would last nine to 10 hours, with only a single lane open in some stretches and a diversion to another road. “Thank God we’re leaving, even if there is traffic,” said Imelda Cuéllar Ramirez, a Mexican holidaymaker who was driving out with eight relatives. More than 40,000 tourists, mostly Mexicans seeking sun during a three-day holiday weekend, were left stranded when the storms struck five days ago. Half the city was flooded, while rising waters brought out crocodiles. Looters ransacked stores. Around 24,000 tourists left in airlifts organized by the military and commercial carriers, but tempers flared as they stood in long lines to get one of the precious seats. 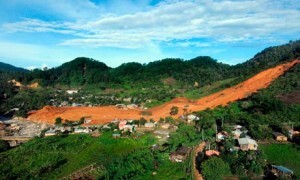 While tourists drove out of Acapulco, hundreds of troops and civil protection workers dug with shovels and pickaxes in La Pintada, the coffee-growing village west of Acapulco swamped by a massive mudslide. Officially, 68 people are missing in the village and two people were killed – their bodies were pulled out of the debris – but villagers fear that scores have perished. The mud collapsed on the village of 400 people during independence day celebrations last Monday (Sept. 16), swallowing homes, a school and church before crashing into the river. The soldiers and civil protection workers, many wearing surgical masks, removed pieces of broken homes and chopped up fallen trees with machetes. Helicopters evacuated more than 330 villagers to Acapulco, but a few families decided to stay back, waiting for news on the missing. Brazilian President Dilma Rousseff with President Obama in 2012. BRASILIA | Brazilian President Dilma Rousseff has called off plans for a state visit to Washington in October because of revelations that the United States spied on her personal communications and those of other Brazilians. Rousseff’s decision, which came despite a 20-minute telephone call from President Barack Obama on Monday night [September 16] in an attempt to salvage the trip, is a big blow to relations between the two biggest economies in the Americas. Ties between Brazil and the U.S. had been improving steadily since President Rousseff [a socialist and former Marxist guerrilla] took office in 2011 and before the revelations that the U.S. National Security Agency had snooped on emails, text messages and calls between Ms. Rousseff and her aides. The spying revelations came from documents leaked by former NSA contractor Edward Snowden. 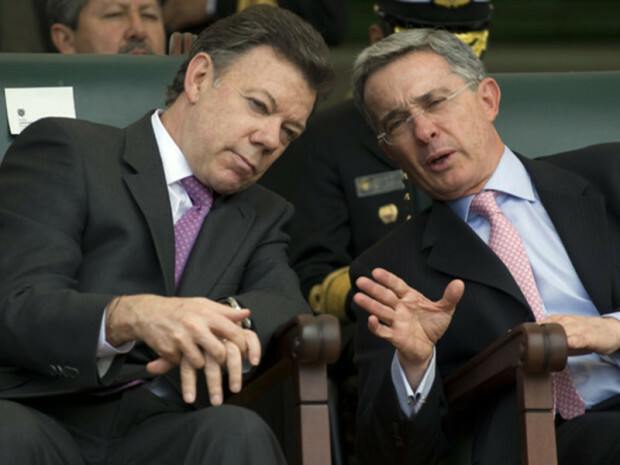 Colombian President Juan Manuel Santos (left), who was former President Alvaro Uribe’s (right) defense minister. BOGOTA | Former Colombian president Alvaro Uribe, revered by many for crippling the power of the country’s guerrillas, announced Monday [September 17th] he is returning to politics with a run for the Senate, saying the country is a mess and he wants to help fix it. Uribe, a 61 year old conservative and lawyer by training, served two terms from 2002 to 2010 and left office with high approval numbers after cracking down hard on the leftist terrorist guerrilla army FARC. He has since been a fierce critic of his successor and former defense minister, President Juan Manuel Santos. He is constitutionally barred from running for another term as president. He will now seek a senate seat in legislative elections in March 2014. In announcing his bid, Uribe described Colombia under his former defense minister and successor – Juan Manuel Santos – as crime-ridden, a turn-off for investors, mired in bureaucracy, wasteful with taxpayer money and on the verge of yielding to the FARC. Uribe is vehemently opposed to peace talks the current government is holding with the FARC rebels. b) How many tourists were trapped in Acapulco for almost a week? c) How were approximately 24,000 tourists transported out of Acapulco? b) What negative economic impact will the Brazilian president’s cancellation of her White House state visit have on private business, and the government? 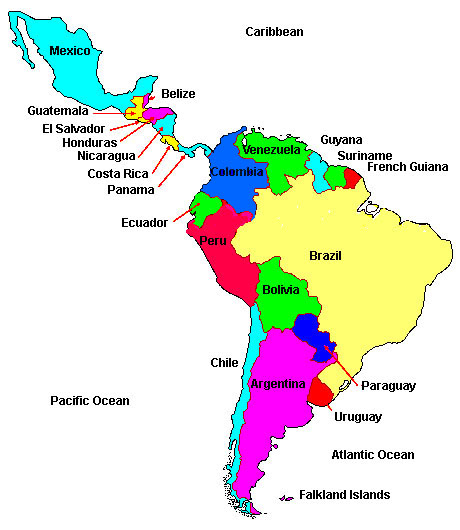 c) In March 2011, President Obama went to Brazil for a two-day state visit (before flying to Chile, a close U.S. ally, and then El Salvador). White House officials cast the trip as a way to renew relations with a region that is an emerging market for U.S.-made goods. In a Reuters analysis: “President Rousseff’s decision to call off her upcoming state visit to the White House is an embarrassing setback that will probably stymie cooperation on trade, regional affairs and other issues for years to come. Despite other priorities, namely Syria, Obama spent 45 minutes with Rousseff at a September 5th summit in Russia to try to ease her concerns. He also made a last-minute plea by phone for 20 minutes on Monday.” Do you think the cancellation of such a high-profile visit, despite two last-minute personal appeals to Rousseff by President Obama, is a negative reflection on Obama’s foreign policy skills, or just an unfortunate result of Snowden’s NSA spying revelations? Explain your answer. b) Read the information about FARC under “Background” below (for more details, visit the link under “Resources.”) Should Colombia’s president negotiate a truce with FARC guerrillas, or is former President Uribe right to denounce this? Explain your answer.